From award-winning physicist, public intellectual, and the bestselling author of A Universe from Nothing Lawrence Krauss, comes "a masterful blend of history, modern physics, and cosmic perspective that empowers the reader to not only embrace our understanding of the universe, but also revel in what remains to be discovered" (Neil deGrasse Tyson, American Museum of Natural History). In this grand poetic vision of the universe, Lawrence Krauss tells the dramatic story of the discovery of the hidden world that underlies reality--and our place within it. Reality is not what you think or sense--it's weird, wild, and counterintuitive, and its inner workings seem at least as implausible as the idea that something can come from nothing. With his trademark wit and accessible style, Krauss leads us to realms so small that they are invisible to microscopes, to the birth and rebirth of light, and into the natural forces that govern our existence. His unique blend of rigorous research and engaging storytelling invites us into the lives and minds of remarkable scientists who have helped unravel the unexpected fabric of reality with reasoning rather than superstition and dogma, and to explain how everything we see--and can't see--came about. A passionate advocate for reason, Krauss gives the rationale for the seemingly irrational--and the mysteries and apparent contradictions of quantum physics, and explores what that means for our lives here on Earth--and beyond. 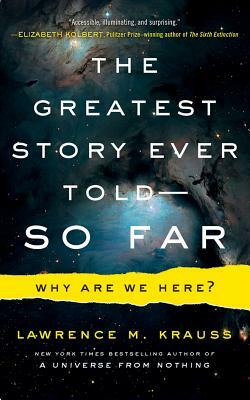 At its core, The Greatest Story Ever Told--So Far is about the best of what it means to be human--an epic history of our ultimately purposeless universe that addresses the question, "Why are we here?"